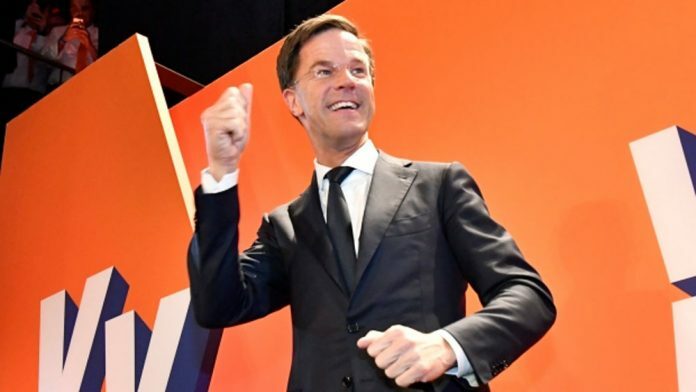 Dutch Prime Minister Mark Rutte on Wednesday claimed a dominating parliamentary election victory over anti-Islam lawmaker Geert Wilders, who failed the year’s first litmus test for populism in Europe. Provisional results with over half the votes counted suggested Rutte’s party won 32 seats in the 150-member legislature, 13 more than Wilders’ party, which took only third place with 19 seats. The surging CDA Christian Democrats claimed 20. Following Britain’s vote to leave the European Union and Donald Trump’s election as U.S. president, “the Netherlands said, ‘Whoa!’ to the wrong kind of populism,” said Rutte, who is now poised for a third term as prime minister. “We want to stick to the course we have – safe and stable and prosperous,” Rutte added. Wilders, who campaigned on radical pledges to close borders to migrants from Muslim nations, close mosques, ban the Quran and take the Netherlands out of the EU, had insisted that whatever the result of the election, the kind of populist politics he and others in Europe represent aren’t going away. “Rutte has not seen the back of me,” Wilders said after the results had sunk in. His Party for Freedom clinched 24 seats in 2010 before sinking to 15 in 2012, and Wednesday’s total left him with about 12 percent of the electorate, far less than populists in Britain and the United States have scored. The fight erupted over the Netherlands’ refusal to let two Turkish government ministers address rallies in Rotterdam about a referendum that could give Turkey’s President Recep Tayyip Erdogan more powers. It gave Rutte an opportunity to show his statesmanship by refusing to bow to foreign pressure, a stance with widespread backing in the nation. It remains to be seen if the 30-year-old Klaver will take his party into the next ruling coalition, which looks likely to be dominated by Rutte’s VVD and other right-leaning parties. Rutte had framed the election as a choice between continuity and chaos, portraying himself as a safe custodian of the nation’s economic recovery and casting Wilders as a far-right radical who was unprepared to make tough decisions. The main political parties, including Rutte’s, had ruled out forming a coalition government with the Party for Freedom. The left-leaning Dutch Labor Party appeared to be hammered by its supporters for its role over the last four years in pushing through a tough austerity package as junior member in a two-party Cabinet with Rutte’s VVD. The coalition Rutte’s VVD party had with Labor can no longer be replicated and the prime minister is likely to look to the right for new coalition partners. Breaking: Dutch Prime Minister Mark Rutte Parliamentary Election Victory Wednesday over anti-Islam lawmaker Geert Wilders. Kind of Populism Fails.